MyPhone unleashed its latest flagship smartphone with “infinite capabilities.” The MyPhone Infinity is the first octa-core device from the local smartphone manufacturer. If you’re following us, we have posted our specs review for Cherry Mobile Omega Infinity phablet last week. How this device pair up with the CM’s phablet will be discussed on a separate article. 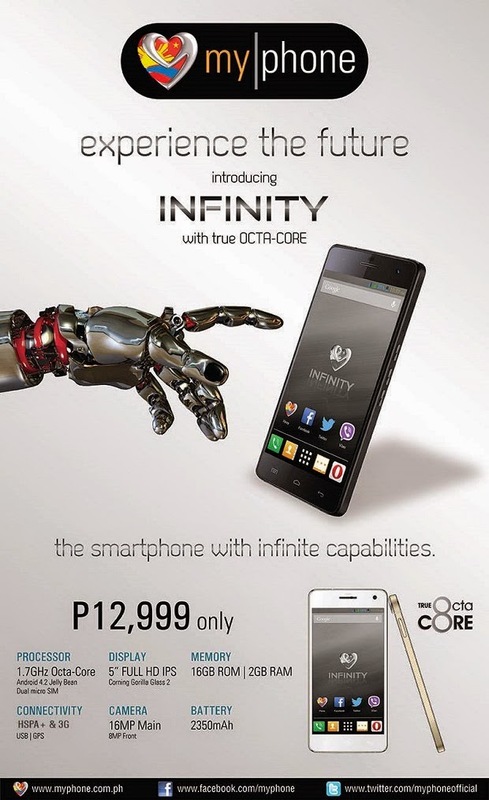 But for now, we’ll take a prompt review on the “other” Infinity’s specifications. The MyPhone Infinity boasts a Full HD 1080p display which makes the screen on the same level of this year’s Android flagship phones. The IPS LCD display looks stunning in an almost 441 ppi pixel denstity. On the hardware side, each of its eight cores ticks in 1.7-gigahertz speed (specifically a MediaTek MT6592 processor). The graphics worker is a Mali 450MP GPU which is known to take in everything thrown at it without choking. The design itself, knowing that it is also offered in gold variant, is patterned with the iPhone 5s. The 2 gigabytes of RAM will bring smooth multitasking functions when paired with the fast CPU. The only downside for this phone, if you may agree, is the 16-gigabyte on-board memory with no expansion option. The main camera of the MyPhone Infinity is rated with 16-megapixel sensor with an autofocus feature and LED flash for lowlight conditions. On the otherhand, the secondary camera is an 8-megapixel affair that could be an easy favourite for your selfie poses. This device is only limited to 3G (HSPA+) support, yes there’s no LTE support in here. Likewise, you’ll have a complete set of radios like Bluetooth, GPS, WiFi b/g/n. This Infinity phone also supports dual micro SIM capability. All of these nifty features will come short it not supported with a 2350 mAh and Android 4.2 Jelly Bean. The MyPhone Infinity is a very promising octa-core phone in a lesser price standpoint when compared to Starmobile and Cherry Mobile’s offering. It is now availavle in respective MyPhone kiosk for Php 12,999.